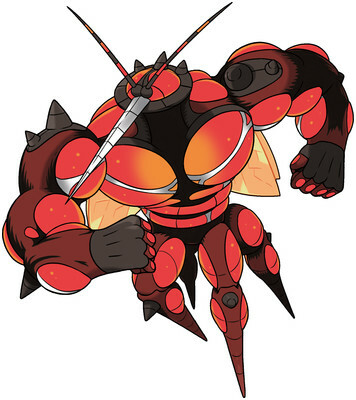 If you have a good moveset for Buzzwole aka UB-02 Absorption, post an answer below and upvote the best ones. Remember, this is for competitive movesets, not in-game. Ability, EVs etc should be included, and we encourage sets for VGC doubles as well as singles. Make sure to read all the guidelines here. Buzzwole Pokedex & learnset for reference. Basically, this is a Hit and Run set designed in order to deal Massive Damge that could OHKO threats like Ferrothorn, Heatran, Mega Lopunny, and some others that cannot resist its Superpowerful STAB move Superpower. Superpower can actually OHKO Mega Gyarados, and also 2HKO Mega Gyarados with 252 Hp and 252 Def, and Impish Nature. Earthquake gets even more coverage and is the key move to deal with Heatran. Ice Punch is a must for Garchomp and Landorus and Gliscor. Lunge and Leech life is Bug STAB. With this set, Buzzwole can outspeed many threats I stated above. And here are some Calculations I made. 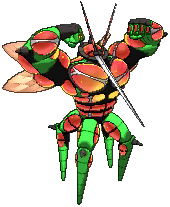 Buzzwole has many attributes that make it a good Choice Band user. Its fantastic physical bulk, useful resistances to Dark, Fighting, and Ground and access to semi-reliable recovery in Leech Life give it good longevity for an all-out-attacker and make up for its subpar Speed. In addition, its very high Attack stat and wide coverage make it adept at breaking down defensive Pokemon. Set Details: Maximum Attack investment and an Adamant Nature maximize Buzzwole's wallbreaking power, giving it a terrifying 621 Attack after the Choice Band boost. 104 Speed EVs allow Buzzwole to outspeed most walls (uninvested base 91s and below) as well as defensive Rotom-W meant to outspeed Jolly Azumarill. The rest are dumped into HP to improve bulk. Moves: Leech Life is a fantastic STAB move, as it is decently powerful and provides recovery. Superpower is Buzzwole's strongest Fighting type STAB. Ice Punch is crucial to hit the omnipresent Landorus-T and Garchomp, and gives Buzzwole good coverage overall by allowing it hit types that resist its STABs, namely Flying types. The last moveslot depends on the needs of the team, as each move is perfectly viable and hits different Pokemon super-effectively. I'll begin by saying something upfront: Bug/Fighting is a pretty bad STAB combination--offensively. That's because Bug and Fighting are both resisted by four different types. But on the other hand, the nature of this set does not need Bug/Fighting to be particularly good, and you don't need strong STAB coverage when you've got Focus Punch and Leech Life. To start, Substitute has naturally good synergy with both of them, and Bulk Up even more so. You're healing yourself with Leech Life on a set that does not naturally have enough room for good HP recovery. And a boosted Focus Punch from this thing, well, it kinda hits hard enough to turn a Dump Truck into garbage. You know, a 300 ton, 3,500 horsepower durable machine of stainless steel that deals with things far tougher than the average Pokemon. 2x resisting Focus Punch isn't going to help much because even then, Focus Punch still has a good 75 base power. Bulk Up makes it so that your opponent can't break the Substitutes you set up, and it has to be said that base 107 HP and 139 Defense are already naturally good. After +1 or +2 those subs are not going to break in one hit. And substitute means you can fire off Focus Punches willy-nilly without you needing to flinch; when your Sub doesn't break your opponent is going to have to eat another. Did I mention how Focus Punch 1-hit-KOs stuff and how Beast Boost makes everything worse? Yeah, that's the fun part. I like this Set but I would perfer Careful Nature (+SpD, SpA) with an Ev Spread 252 SpD, 252 Hp and 4 Atk. Because Buzzwole needs the bulk then more offensive power. Careful is definitely a good choice. It's just that doesn't give you much of a raw stat increase since with max Sp. Def EVs, Buzzwole's Special defense hangs at the low 200's at level 100. Still, you definitely have a point. Ultra Sun & Moon added something I've been waiting for Buzzwole to get: Drain Punch. This means you'll have 2 powerful STAB Moves that restore your HP. With your 2 STAB Moves constantly restoring HP, this Assault Vest set becomes a lot more usable. Those together with Earthquake & Ice Punch give amazing coverage. You can opt for a Careful Nature instead of Adamant for a bit better Sp. Defense, but know that you'll have a pretty big Attack drop in the process. This is a really Odd set originally made by Pimpnite. His latest video shows this set later in the video so be sure to give him credit for this set not me. Although, I am the one posting it so here it is. The purpose of this set is special Sweeper/Special Attacker. First, Use Focus energy to boost your Critical chances even more, Then use Work up unil you maximize Sp. Atk and Attack ( Even though Attack won't be needed in this set as the only attack in this set is hidden power, which is a special attack which is why the Special attack EVs instead of attack ) HP bug for knocking out opponents, And roost for recovery, Watch out for EQ which is really common in competitive. Hellfire It's not against the rules or the mods wouldn't of approved it so Im not sure what you are complaining about and why is this post flagged? I bet a lot of people post sets here that arn't theirs. It's the internet I can post whatever set I wan in the appropriate categories as long as it abides by the rules. Again, if it was against the rules this post would be hidden but it's not now is it? Fizz, I don't see how this would break the rules, I am really just trying to promote their set. And anyone can use any set they want, technically it's not anyone's set. they are moves buzzwole can legally learn so therefore I am not breaking rules. I do not wish to argue with a mod, however so I will just drop it at that. I already said you are not breaking the rules. Are there suppose to be 2 Buzzwole?